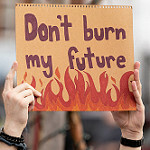 On Friday, March 15th, 2019, hundreds of thousands of youth all over the world left school to participate in a global youth climate strike. Youth Climate Strikes took place in over 1,300 locations across 98 countries according to CBS News. The strike was inspired by 16 year old, Greta Thunberg of Sweden, who opted out of going to school each day since late last summer, to stand in front of the Swedish Parliament in protest of adult inaction on climate change. In Seattle, about 250 people participated in a youth climate strike at Cal Anderson Park. The event was youth led and youth organized. KBCS’s Michelle Martin interviewed 12 year old Taro Moore of Kenmore Middle School, who spoke at the rally.